Written by Catherine Saxelby on Saturday, 03 October 2009. Trying to eat light and cut back on sugar? Then watch what you drink. Soft drinks, juices, flavoured mineral waters, fruit-based drinks and sports drinks are the major source of sugar, according to CSIRO who analysed the Australian diet for sugar intake. Collectively these drinks supply 30 per cent of the added sugar adults consume but as much as 47 per cent in teenage boys who have a sweet tooth and are the biggest consumers of sugar. A 375ml can of soft drink contains around 10 teaspoons of sugar and 650 kJ, equivalent to 2 thick slices of bread or a baked potato. Just one can takes you close to the suggested maximum for a woman for the day - around 11 level teaspoons of sugar (or 44 grams) a day which represents a ‘moderate' sugar intake for a lightly-active female. A glass of fruit juice, even if labelled ‘no added sugar' or ‘natural', is also high in sugar, with around 5 teaspoons of sugar. Ditto for cordial. While sugar doesn't cause diabetes or heart disease, it's wise to moderate your intake to help prevent obesity. Sweetened drinks account for the biggest share of our sugar intake. Following that, it's the sugar we use at home in coffee/tea and on cereal (as well as jam and honey), followed by doughnuts, pastries, cakes and pies that account for most of our sugar. Try not to hold or ‘swish' the drink around your mouth, as this increases the chance of dental decay and enamel erosion. Use a straw to minimise contact of the teeth with the beverage. Try to drink chilled drinks as cooler temperatures are less likely to do damage. Drink water instead of some of the sweetened drinks you now drink. After a juice, soft or sports drink, drink a glass of water as it helps wash away the sugars and acid and increases saliva flow. 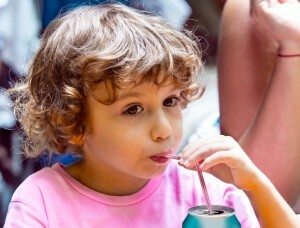 Excessive consumption of soft drink, especially by children, is now considered a factor in obesity. Nutritionists believe soft drinks encourage ‘passive overconsumption', a term that means they are easy to swallow without the ‘filling power' of solid food. A UK school program intervention of 644 children aged 7 to 11 years discouraging consumption of fizzy drinks was successful in slowing rising obesity rates over 12 months. By comparison, in the group which was not encouraged to reduce its intake, the number of overweight and obese children rose significantly. Theoretically, the researchers calculated that the daily consumption of just one can of sweetened fizzy drink per day over a 10-year period - with everything else remaining the same - can add 50kg to your weight over 10 years. Keep soft drink for special occasions. Dilute fizzy drinks and juices with ice or water - think of them as ‘flavourings' to make water taste nicer. They're too concentrated on their own. Swap to sugar-free diet drinks or even sports drinks - they have only half the sugar. Keep your kids used to sports waters or lightly flavoured drinks. Reference: James J, Thomas P, Cavan D, Kerr D. Preventing childhood obesity by reducing consumption of carbonated drinks: cluster randomised controlled trial. BMJ 2004 328:1237 (22 May). Download my free Fact Sheet on Sugar entitled Sugar: Are you sweet enough? Read why switching to juice isn't the answer either. Q. Is high fructose corn syrup worse than sugar? Vitamin waters - health drink or sugar hit?